You’re planning on taking the GED and you’re looking for the best test prep book to get you ready. We can help. There are a lot of “Best GED Prep Book” lists out there. Most of them aren’t all that great. Some haven’t been updated in years. So we’ve put together a better list. We’ve looked at most of the books available today and we’ve written a brief bio for our favorite picks. Heads up! The GED test was revised for 2014 and its changes have made the exam tougher. Passage rates have dropped due to a greater focus being placed on critical thinking and reasoning. We’ve only included books on our list that had been revised to accommodate for those changes. If you’re planning to take the GED in the future, use current prep material as the new GED is much more different than before. 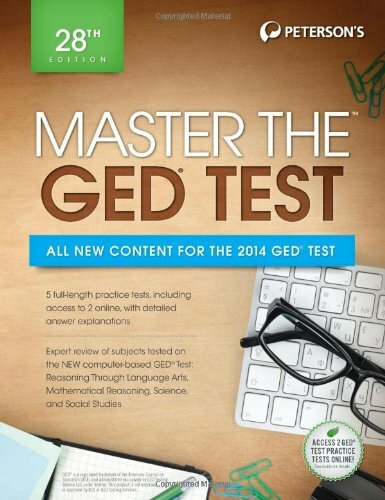 Kaplan’s GED study guide is a self-study prep book, fully updated for the latest 2014 GED test. While some GED guides are designed for classroom use this one is not. You’re in full control here. And the material includes everything you need to study on your own. You’ll find comprehensive review of all the GED testing topics. There are more than 1,000 practice questions to practice with too. Detailed answers explanations are included for all questions. Kaplan also added a good mix of strategy advice into the mix. Testing strategies work and make obtaining higher score easier. What’s important is that Kaplan included an in book diagnostic pretest. It’ll help you establish your study plan and identify your strengthens and weaknesses. Also part of the bundle are 2 full length practice tests. One of them is online and its accompanied with a feedback tool that helps pinpoint your problem areas. You can then refer to the online videos to tackle your poorer areas. Kaplan’s Strategies, Practice, and Review is the best GED prep book for most test takers. It has everything you need – review, strategy advice, and practice. Princeton Review’s Cracking the GED Test is our second favorite book. It’s the newest book on the block and it’s one of the clearest guides to work through. Every aspect of the test is broken down. So there’s coverage touching: reasoning through language arts, mathematical reasoning, science, and social studies. As an added bonus there are customized study “road maps”. You can choose different paths for a more more personalized study routines. One that better suites tackling your weakness areas. There are 2 full length practice tests included with answers and explanations to match. The question quality to be like that of the official test. Extra practice questions are also available online through Princeton Review’s online portal. The portal itself is a great add on with some extra testing exercises and goodies. Princeton Review excels at teaching testing strategies and this guide is packed with them. Some of them may seem like common sense but others truly help you test smarter. The book’s also part of the GED Publisher Program. It’s a program that recognizes content from publishers whose material meets 100% of the GED test objectives. Here’s another well composed GED prep book that has been updated for 2015 – this time from McGraw-Hill, one of the biggest names in education books and publishing. McGraw-Hill’s flagship book offers bite sized, easy to understand lessons on each of the four tested subjects found on the GRE: Reasoning through Language Arts, Mathematical Reasoning, Science, and Social Studies. There book is very well laid out and provides plenty of practice and review for the exam. At 992 pages in length, you’ll find two full length practice tests within and more than 1,000 practice questions with explanations given. It’s comparable to Kaplan in that regard, but we found Kaplan to offer more strategic advice with stronger quality practice questions. That said, McGraw-Hill’s Education Preparation for the GED also includes a pretest to identify what areas of study need the most focus. There’s nothing that really stands out in the book’s content. It’s well rounded and offers the most important elements that make up a good GED prep book. REA’s GED Math Test Tutor is designed to help you pass the math portion of the GED. The book’s been designed to act like a personal math tutor – guiding you through every math based topic on the GED and making sure you understand it. The math section is for most GED test taker’s the toughest part of the GED test. Author, Sandra Rush, gives you the tools you need to tackle the exam: math knowledge refresh ( from polynomials and powers to statistics, fractions, decimals, etc), helpful testing hints and strategies, calculator use tutorials, and more. We found the step by step instructions on how to use the TI-30XS Multiview calculator to be helpful, especially for those still unsure of its full capabilities. The included, 2 full length practice tests were filled with high quality questions and the answers were detailed with thorough explanations. We were never left scratching our heads. In general, the Math Test Tutor is a simple and easy to understand GED Math prep book. If you’re struggling with math, this is the best book to help you. Just remember it doesn’t cover any of the verbal components of the GED – you’ll have to look elsewhere for that. Barron’s also one of the few prep book publisher to have updated their material to reflect the changes of the new computerized 2014 GED. This time our opinion is slightly varied. How to Prepare for the GED Test includes four full length practice tests as well as a diagnostic pretest which is fantastic. Other publishers are only offering two practice tests; getting double that is fantastic. Sadly, numerous typos and mistakes have been found in the book. We were also disappointed to discover that the accompanying CD doesn’t actually give you an actual score – it just provides a tally of wrong answers. Not very useful. On the flip side, you’re offered a lot of practice opportunity from the book. And we found that Barron’s test question quality to be strong – in line with that you can expect on testing day. We hope that Barron revises the book and irons out the kinks because there’s plenty of value in this GED prep book. 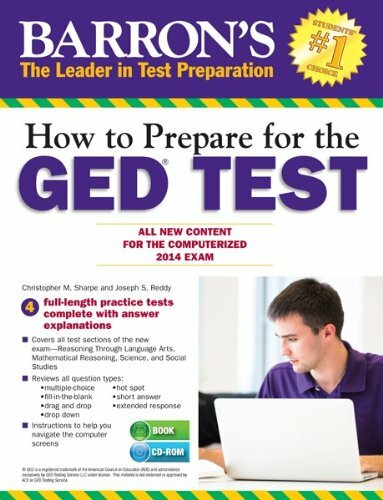 We’ve included How to Prepare for the GED Test on our list as it’s still one the better GED prep books out there designed for the GED 2014. But if you have the opportunity to pick up Kaplan or McGraw-Hill’ GED books you’ll find a higher quality and more consistent experience. Peterson’s latest GED prep book is also gaining a recommendation from us. It’s a comprehensive guide that offers sound test prep and review material. Master the GED Test also offers a diagnostic pretest allowing you to identify your weaknesses and strengths. The book features plenty of review material and two full length practice tests complete with answer keys and explanations. What’s neat is that part of the bundle is; a a study guide that contains a list of about 500 commonly used GED vocabulary words, a list of the top 10 test taking tips, and access to Peterson’s online repository featuring additional practice tests and quizzes. After looking through the book we noticed that Peterson expending effort in making sure every type of question you can expect on the GED is covered and offered practice on. That’s important as it makes sure your exposed to key concepts and offered an opportunity to reinforce the material. Beyond that, the writing style is straight forward and friendly. There’s a conversational tone used throughout – so it won’t put you straight to sleep. Overall, Peterson has create a compelling product. We’ll add, we have heard complaints that there are some incorrect answers found on the online portion of Peterson’s prep but we’re confident those will be quickly addressed.